Brighton Fringe may be long gone but you don’t need to wait until next year to get your fix of theatre, comedy and cabaret. What’s not to love about spending the run up to Hallowe’en huddled in the dark, wondering what might be lurking behind the stage curtain? Following two successful years, Brighton HorrorFest is returning on the 16 October for 13 days of fear, and upstairs at the Welly in Upper Gloucester Road is one of the key venues for this city-wide event. 2018 sees the biggest programme yet, with the return of Edinburgh Fringe sell-out hits, Father of Lies and Talking to the Dead, and a modern day séance show boasting all the old Victorian parlour tricks. Other offerings include Phantasmagorical – a spooky storytelling show with a magical edge, and Fear Itself – a TED talk gone wrong with a terrifying finale. Local companies are stretching their macabre muscles, with cabaret, burlesque, spooky storytelling, and special adaptations of 19th century Sussex folk tales. Extraordinary storyteller Jason Buck is also making a welcome return with his new selection of stories in Love, Death, and the Devil’s Son. 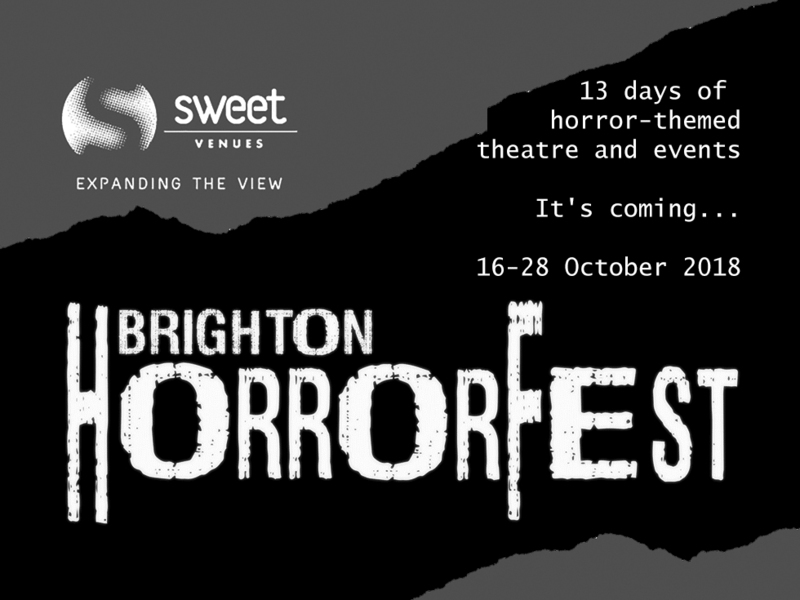 This year’s HorrorFest sees shows travelling down to Brighton from all across the UK, with Liverpool-based Thaddeus Bent’s Fear-tre of Fear telling character-comedy filled ghost stories, and Victorian beat poet Paul Voodini from Sheffield presenting The Raven and Other Nasty Poems. Essex-based Tracy Wise explores the dark origins of fairy tales with Nursery Crimes. If you prefer your scares based in a more cerebral setting, Adrian Jameson is presenting lectures about The Devil and The Witch Hunts, and Two Bit Productions provide The Worm King, a live scored audio drama about a documentary team visiting Chernobyl. Multi-award-winning writer/performer Emily Carding performs Quintessence, a modern Frankenstein tale with an Artificial Intelligence twist, developed earlier this year in association with the London Science Museum. Hermetic Arts are also returning with Unburied, investigating the story behind the missing tapes from a 1978 children’s Folk Horror TV series. Following along with the TV theme, Will Swygart returns with a special horror-comedy edition of his Niteskreen franchise which delighted squealing audiences at Brighton and Edinburgh Fringe earlier this year. There’s also Extreme Improv Halloween Mayhem, and award-winning sketch troupe Dirty White Boys present Mistress to the Midnight; a live spoof of the classic British horror film. For the movie fans, the Boo-tique Cinema will be screening short films from local upcoming film-makers and linking them up with some classic (and some more obscure!) features.